← Has Clinton Made Her Second Pro-War Mistake? Israel still retains absolute mind control over the western world, thanks to the selling of an Israel narrative which was boosted high into the literary lights and onto movie screens with the fictional Israeli narrative written by Leon Uris in 1954. After its publication, the novel Exodus became the guide book for all who studied, traveled, or gave even the slightest attention to the start of the modern nation of Israel in 1947-48. How powerful is a movie image? The Guardian reported that when Ronald Reagan first arrived at the White House as president, he wanted to see the “war room” which he had seen in the movie, Dr Strangelove or: How I Stopped Worrying and Learned to Love the Bomb. 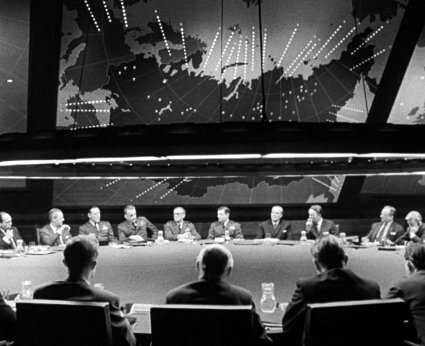 He had to be told that the Strangelove war room was a movie set, (shown below) built at Shepperton Studios, Shepperton, Surrey, England. In reality, the real war room is much smaller. Was the President serious? As one line from Strangelove puts it, “No one could say”. Exodus, the novel by Leon Uris, was far removed from the reality of Palestine in 1948. Undeterred by reality, the novel grew into a 208 minute, 1960 movie version, with Paul Newman as Ari Ben Canaan, a leader of the Hagannah (the Jewish underground), and Eva Marie Saint, as Kitty Fremont, his love interest. In one scene, Kitty sits beside Ari on a hill overlooking what he tells her is the ancient Valley of Jezreel. He then informs her, pointing, that below are the ruins of Megido. He also points to Mount Tabor. Overwhelmed by his superior biblical certainty, she answers quietly, “In a Presbyterian sort of way”. Having established his biblical knowledge superiority, Ari tells Kitty how his people conquered this land centuries ago. 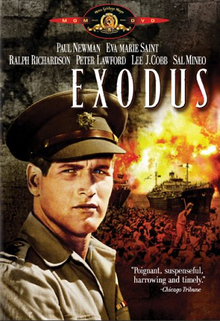 It was the generation that absorbed Exodus as novel and as a movie, that accepted and acted on, the Israel “narrative”, which Ari Ben Canaan is convinced is biblically sound. Would Paul Newman deceive us? The lone Presbyterian voice in the film who might have countered Ari Ben Canaan’s certainty, was merely a biblical student “in a Presbyterian sort of way”. How was she to know there was another “narrative” that told an entirely different story? In 1954, the Palestinian narrative was lodged in very few western world views. Today, sixty years after the novel Exodus first appeared, the Palestinian narrative has great difficulty being heard in the cacophany of a culture shaped for more than six decades by propaganda (hasbara) campaign, each defended with bogus cries of “anti-semitism”. Over time, however, reality continually forces hasbara spin masters to launch new campaigns. The latest: The sudden discovery and immediate peddling, of a series of “rights”, promulgated simplistically by advertising spin masters. “Israel has a right to exist” was the first of a recent set of slogans pushed by Israel’s hasbara teams. That “right” was followed by “Israel has a right to exist as a Jewish state”. Standing alone, of course, these lies have no connection to reality. But who notices? On the surface, everyone believes in “rights”. Beneath the surface, the issue of the clash of rights is ignored. Then came the granddaddy “rights” claim of them all, the kind that sends a heavily armed militaristic nation into repeated wars, a simplistic granddaddy lie now robotically repeated by world leaders (Obama) and would be leaders (Clinton): “Israel has a right to defend itself”. Israel “defends itself”exactly the way cigarette companies defended themselves by lying about the cancer-producing product they peddle to children who quickly become addicted to nicotine. How does Israel defend itself? Among other options, Israel hurls 5,000-pound GBU 28 bunker-buster bombs on a civilian population of 1.8 million Palestinians who are jammed into a tiny strip of occupied land. Richard Silverstein, a Seattle, Washington blogger, writes a daily blog, Tikun Olam. His postings demonstrate a deep commitment to Judaism as his religious tradition.. He speaks fluent Hebrew. He has excellent sources within Israel who provide him with news leads. Silverstein knows a lie when he sees one. He watches for them on Israeli Hebrew language television. He’s an expert at this: hijacking whatever terrorist incident is grabbing world headlines (he did it memorably on 9/11) and piggybacking his own obsessions onto it. So with the world’s attention shifting slightly from Gaza to Iraq; and with the beheading of a U.S. journalist by ISIS searing the world’s TV screens, he forcefully guides world attention back to his own agenda: Hamas. There is no connection at all between ISIS and Hamas. None. Bibi made it all up out of whole cloth. And he doesn’t care. He figures if anyone catches him in a lie he’ll be long gone onto the next lie. Silverstein’s reference to 9/11 recalls the statement that Netanyahu made after the attacks on U.S. targets on September 11, 2001. Even after generously allowing Netanyahu to “edit” himself, the Times did not conceal that Netanyahu was not thinking in terms of sympathy for the victims of 9/11 and the United States, nor what a “friend” could do to help America. Rather, he was already thinking on the day it happened about how 9/11 could be manipulated to get America to do more for Israel. Silverstein’s source inside Israel, unnamed, of course, “has excellent contacts among Israeli military and intelligence circles”. His source tells him “there is a 90% likelihood Deif was killed yesterday. I say all this advisedly, since I know that if the story turns out to be true it will cause perverse rejoicing in the halls of power in Israel. And this is the sort of rejoicing that will destroy Israel in the long run”. “I’ve learned by experience that my source is often right, no matter whether I want him to be or not. So I feel it’s important to release this claim and test how it plays out over the coming days. Ponder this for a moment: 5,000-pound GBU 28 bunker-buster bombs were dropped on a single house in Gaza. Israel obviously can pinpoint a target when it wishes to do so. It makes many claims that it “did not intend” to strike a United Nations school or a hospital. That is not true. Schools and hospitals are not struck by mistake. These are large buildings and Israel’s ability to pinpoint targets is demonstrable. Schools, hospitals and private homes belonging to Hamas officials and ordinary citizens, are deliberately targeted. It remains now for a respected, credible, fact-finding investigation to verify this. The verification will not be made if the U.S, and other western nations prevail in their current effort to block any investigation remotely related to the UN. “The United Nations drastically underestimated the devastation that could result from possible assaults by Israel on Gaza this year, with 350,000 people so far displaced from a six-week-old conflict — seven times the 50,000 foreseen in its contingency plan, the top Unicef official for the crowded Palestinian enclave said Wednesday. The pack of lies that Netanyahu rode into this latest massive invasion has been repeatedly exposed outside the mainstream media. The Nation magazine, definitely not mainstream published an editorial that summarized all of the lies. Reflexive US support for Israel by politicians from both parties is of long vintage and no surprise to anyone. Even so, it was shocking and shameful to hear White House and US diplomats repeatedly voice support for Israel’s “right to defend itself” as it rained bombs and missiles down on the people of Gaza. Much of the US media repeated tired clichés about the “cycle of violence,” as if the conflict began when three Israeli teens were kidnapped and murdered. But lost in the media frenzy was the deeper context to this latest round of bloodshed. The collapse of the ill-starred peace process in the spring had created a dangerous vacuum. . . . The [Israeli] government saw its opportunity in the kidnapping of the three teens [in the Hebron region]: although Israeli police were almost certain within days that the teens had been murdered—and almost certainly by freelance thugs rather than Hamas operatives—the Shin Bet placed a gag order on the media so that it could round up hundreds of Hamas members. At the same time, the government ginned up a #BringBackOurBoys campaign—a cruel deception of the anguished parents, but also part of a strategy to foment public hysteria against Palestinians in general and Hamas in particular. Israel’s grip on the western mindset with lies like those summed up above, cannot live on Paul Newman’s Exodus inspiration forever. This entry was posted in -Movies and politics, Middle East Politics, Movies, Netanyahu, Obama, Uncategorized. Bookmark the permalink. Thanks, Jim. You are absolutely right. “Exodus” was the Zionists’ most deceptive and “novel-way” to brainwash young Americans back in the early 1960’s, onward. In the last month alone, Israel created well over 100,000 refugees in this narrow Strip called, Gaza. Israel’s intention is to generate “ethnic cleansing”, as some of its leaders have stated publicly. “Israel has the right to defend itself’? Let’s hope that many more young Americans, including church groups, will learn more about the real situation in the Holy Land, by visiting the scene of the crime and judge for themselves.. Thanks you James for this very informative and comprehensive item. The Gaza people are paying a heavy price, but I think eventually the lies of the Israeli PM and the whole operation will catch up with them and they will be exposed. Yet I wonder how many more need to suffer before this happens and justice prevails.